This past weekend Sarah of Broma Bakery came to stay with me in Chicago and we treated ourselves to something sweet every single day. It was a bit unusual to me but life is all about balance, well-being and feasting on happy moments; sometimes these special occasions call for frozen yogurt, doughnuts AND chocolate chip pancakes. Ha! We had the absolute best time together and I can’t wait to share more photos of our baking plus our Chicago adventures! In the meantime, I’m getting back to eating all the veggies and indulging in healthier treats (rather than doughnuts). Anyone that knows me well can attest to the fact that I am a huge advocate of a treat during the day or even before bed. In fact, Tony always gives me this ridiculous look anytime I ask for frozen yogurt or a bedtime snack because it’s a must have in my world. Even a small treat such as a spoonful of almond butter with a sprinkle of sea salt can usually give me the greatest satisfaction. It should be noted that I also tend to eat lighter dinners so for an active person like me, it’s only natural to crave something around 9 or 10PM. 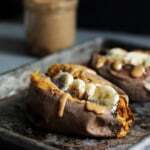 And of course, there are times when a spoonful of nut butter and a banana just does not cut it. Or when I’m craving something sweet and creamy like frozen yogurt, but I don’t feel like leaving the house just to drive to get it (okay, but sometimes I do… ha). Lately I’ve been doing my own healthy version of fro yo at home. It’s incredibly easy and basically just involves serving a creamy thick protein smoothie in a bowl, covering it with your favorite toppings and eating it with a spoon! I know, super fancy stuff right here but you know you LUVS it. It makes breakfast feel like a real treat. You’d actually be surprised at how thick and creamy these smoothie bowls can get, especially with a scoop of protein powder in the mix. 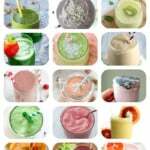 Best of all, you can make these with your personal favorite protein powder and mix and match what kind of fruit goes into the smoothie. 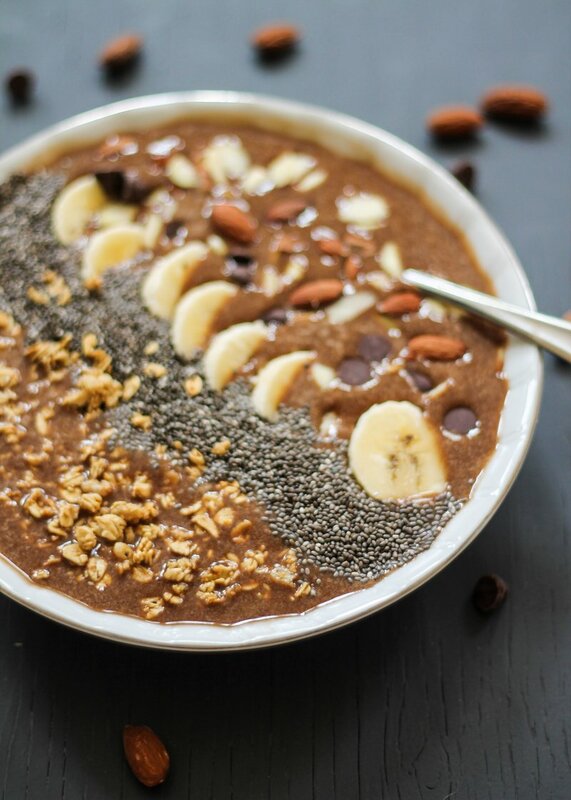 Lately I’ve been into a chocolate banana protein smoothie bowl because chocolate makes me feel like I’ve indulged a bit. I use a chocolate protein powder and Chocolate Almond Breeze almond milk. Other favorite smoothie bowls include strawberry banana, blueberry vanilla, raspberry peach… actually there are just too many to name. I often enjoy these for breakfast hence why you see a instant coffee packet in the picture above. 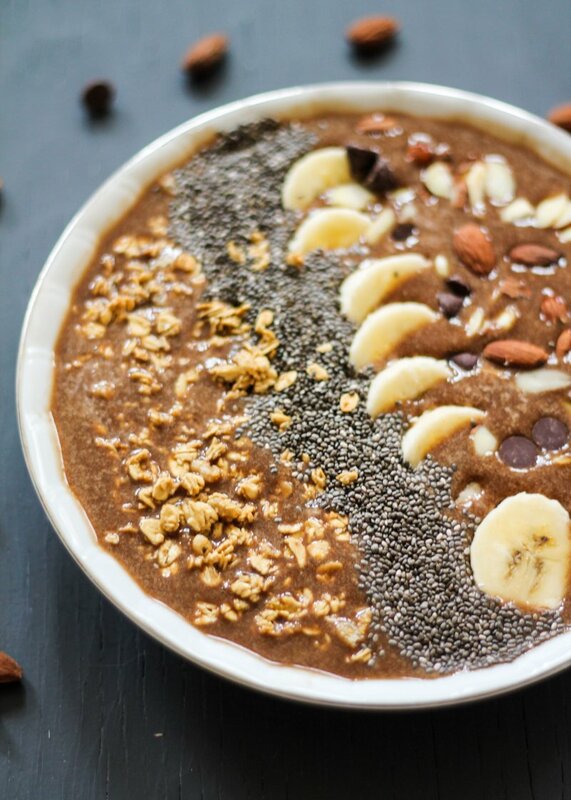 Mocha smoothie bowls FTW! 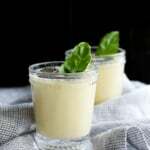 There are endless possibilities here so if your a frozen yogurt and/or sweet tooth fanatic like me, I’m sure you’ll find this easy base recipe to come in handy. Nutrition only includes banana, protein powder, spinach, almond milk and coffee. Protein powder is based off of 1 scoop around 100 calories with no added sugar. This post is sponsored by Almond Breeze Almond Milk but I love their almond milks and have been using them for a long time. Thanks for continuing to support AK and the brands I work with! 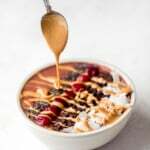 42 Responses to "Mocha Banana Protein Smoothie Bowl with all the toppings your heart desires"
I am ALL about a smoothie bowl! I can’t do typical smoothies, because I like to chew my food, which makes a smoothie bowl PERFECT. Especially when there is mocha and protein goodness in there. P.s I am TOTALLY an eat-before-bedtime girl too! SNACKAGE FTW! Pinned! Yum I love making banana ice cream and mixing in protein powder. The toppings here look amazing!! 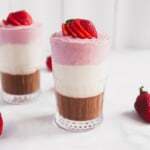 This is my go to summer dessert. Thanks for sharing!! 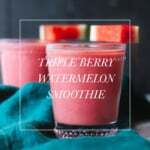 The only thing better than a smoothie is a smoothie loaded with toppings 😀 And I’m totally with you on needing to eat before I head off to sleep — there’s no way I’d be able to fall asleep otherwise! This sounds like such a delicious snack. 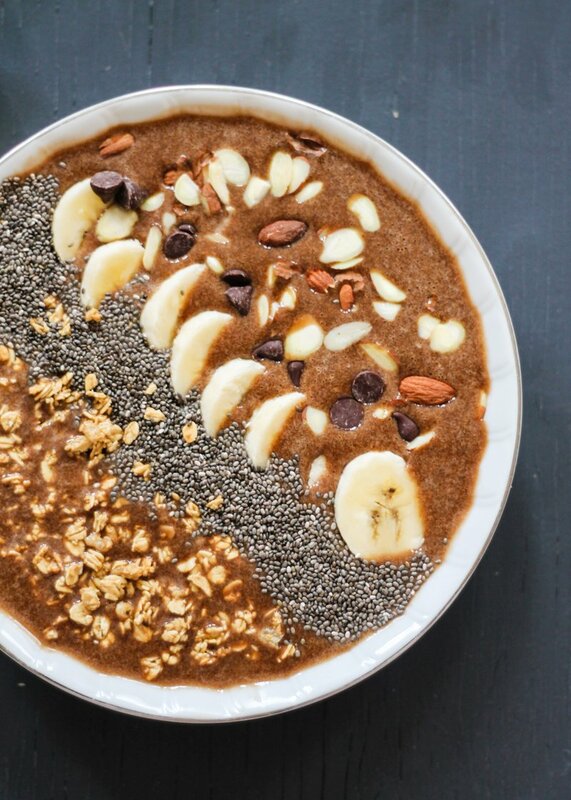 I’ve never had a smoothie bowl or even thought of one, now I like neeed to try this! Fo yo for life over here, so anything that resembles it that can be made at home? I’m game!! Yuuuuuum!! This smoothie bowl sounds so good!! Smoothie bowls are genius! All of the flavors going on here would be simply delicious! I can imagine how delicious these smoothie bowls must taste.. I am a massive fan of breakfasts like this! 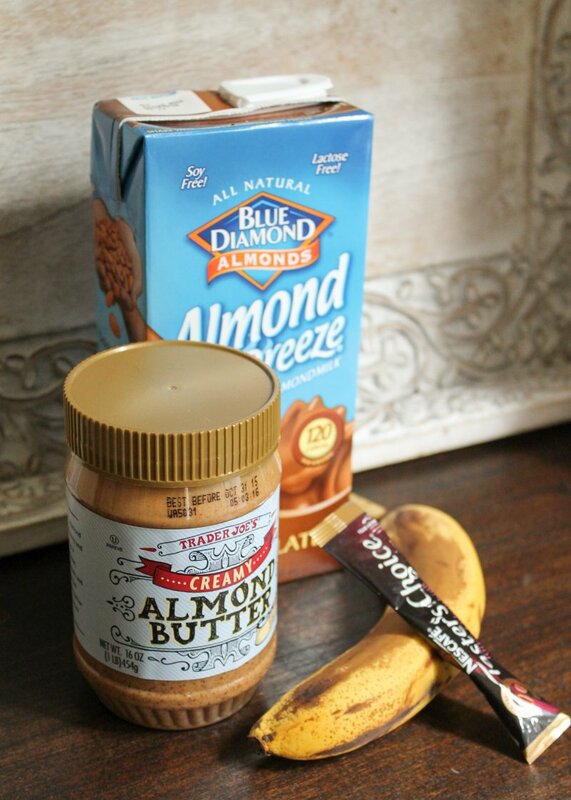 I’ve never tried a smoothie BOWL before but think I’ll have to now…subbing peanut butter for the almond items! Yes, I am all about really thick, creamy smoothie bowls that kind of feel like you are something a little naughty and indulgent, but are secretly packed with awesome good-for-you nutrients. This sounds exactly like something I would love to make! Sounds good I wanna try it with oatmeal. Yum! Thank you! 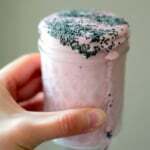 Do you have a favorite protein powder? This sounds amazing! Definitely trying very soon. Is there any alternative milks you would recommend other than almond or coconut milk? You could use any milk you’d like! I don’t typically soak them – they expand a bit from the liquid in the smoothie bowl, and they’re very easy to swallow with all of the ingredients in here (so I wouldn’t worry too much about them sticking in your throat). Feel free to soak them if you’d like!